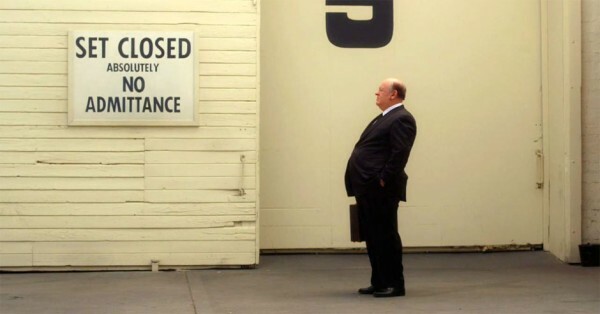 Alfred Hitchcock has the unique distinction of being the only film-maker in history who can be readily identified by nothing more than his silhouette. Through his television interviews and the dry, morbidly funny introductions he performed at the beginning of Alfred Hitchcock Presents, he became not just a director of iconic films, but an icon himself. Yet despite, or perhaps because of, his well-crafted public persona, there is still something fascinatingly unknowable about the man, the obsessive son of a grocer who (allegedly) did everything short of torture his actresses in pursuit of realising the images in his head. There's certainly potential for a great psycho-drama about Hitchcock, or at the very least an interesting one about whether or not the themes that underpin his work - paranoia, voyeurism, a fear of authority - bled into his private life. Sacha Gervasi's Hitchcock is not that film, though in its defense, it has the good sense not to try to be. Based on Stephen Rebello's well-regarded, scrupulously researched non-fiction book "Alfred Hitchcock and the Making of Psycho," the film is, unsurprisingly, about the uphill battle that Hitchcock (Anthony Hopkins) faced in making his 1960 masterpiece, Psycho. The film is at its best when getting stuck into the behind-the-scenes dealings that went into the production, from Hitchcock putting his own money up when Paramount refused to finance the film to his famous insistence that the shower scene would work better without music. Hitchcock doesn't go into a great deal of detail about the creative process - which, frankly, would have been wildly presumptive of Gervasi - but as a potted history of how a great film came to exist it works well enough. The supporting roles in those parts of the film are nicely rounded out by the likes of Toni Collette as Hitchcock's assistant Peggy Robertson, Scarlett Johansson as Janet Leigh, and James D'Arcy as a convincingly nervous and unnerving Anthony Perkins. None of them are expected to do much besides occasionally re-enact certain key moments from either the film or its production, but they all give performances which fit the breezy tone of John J. McLaughlin's script. The problems with the film manifest themselves whenever its focus drifts away from the production towards Hitchcock's home life with his wife, Alma Reville (Helen Mirren) and whenever it attempts to get to grips with his inner life. Reville was Hitchcock's closest, most trusted collaborator, the one person whose opinion he trusted above all else, and it's clear that Gervasi and McLaughlin want to shine a light on her largely unheralded role by depicting their relationship. However, their execution plays out in a way which is completely counter intuitive, and by sidelining her in a sub-plot about her collaboration - and possible romantic affection for - screenwriter Whitfield Cook (Danny Huston) ends up completely belittling her contribution, especially when their creative partnership ends up being subsumed into an all too easily resolved marital fracas. The biggest problem with Hitchcock, though, is Hitchcock. There is a delicate art to playing a real-life figure and not becoming a caricature, an art which only Michael Sheen seems to be able to carry off consistently. Anthony Hopkins is a perfectly fine actor, but his Hitchcock comes off as little more than a so-so impression, one that is eerily lifeless. A large part of that is due to the make-up, which repugnant and nauseating to watch in motion. Alfred Hitchcock was not the most aesthetically pleasing man, but at the very least he didn't look like a Doctor Who villain. There's something distinctly inhuman about the effect, which creates a distance that the film never manages to bridge, especially since its attempts to make Hitchcock seem more human are, frankly, bizarre. The film opens with a staging of a murder committed by Ed Gein (Michael Wincott), the serial killer who served as the inspiration for Norman Bates. After the deed has been committed, the camera pans across to show Hitchcock watching the grim scene play out whilst the familiar strains of "Funeral March of a Marionette" play in the background. It's a witty way of entering the story, but the film keeps returning to Gein, who appears to and speaks with Hitchcock in a series of dream sequences which are blandly staged, overly obvious, and drag the film down into the sordid realm of pop psychology. These attempts at some sort of insight are so ineptly implemented - most notably a re-staging of the shooting of the legendary shower scene - that they make Hitchcock less interesting, not because they reveal too much, but because they are so hamfisted they're laughable. Hitchcock is an inconsequential film about a man who was anything but inconsequential. It's not wholly worthless; the supporting performances are good, the production design is well-observed and the time spent focusing on a masterpiece in the making can't help but be interesting, especially to anyone interested in the film in question. Yet the things that are wrong with the film are so central to its DNA that the highest level it achieves is diverting, and even then only infrequently. Anyone interested in getting a sense of why Hitchcock was such a great film-maker should just watch Psycho, which has far more to say about the man who made it than the film which bears his name ever could.